Brazilian soils are generally acidic with low base saturation and low plant available potassium (K). Potassium fertilizers play important role in production costs and farmers receive no governmental subsidies. Strategies are needed to improve potassium fertilizer delivery to different regions in Brazil and to establish affordable prices and balanced potassium consumption. For such strategy, it is necessary to take into account the different soil classes with its varying K levels. The purpose of this study was to map soil K in Brazil considering the different biomes and applying techniques to reduce problems caused by limited soil profile data. A soil profile data set was constructed from the soil archives of Embrapa Soils, Rio de Janeiro, Brazil. Descriptive statistics was performed on K levels in different soil classes and biomes. The different soil K levels were grouped in intervals and mapped using ArcGIS 9.1 tools from ESRI. Brazil’s soil map and biome map at 1:5,000,000 scale were used in the geoprocessing. 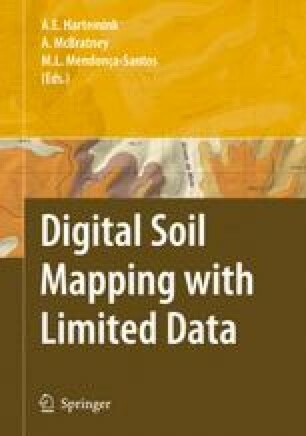 Our results showed that mapping soil K levels based on soil survey reports at the regional scale is difficult because of limitations in georeferencing and spatial distribution of soil profiles. However, this mapping would help fertilizer distribution planning in Brazil.